SENIOR CITIZENS can recall the era before the television, when the family gathered around the radio for the latest news, music and comedies such as "The Jack Benny Show." Let's not forget dramas like "The Long Ranger" and "Gunsmoke." As you can see, some of these great shows were on the radio before they were on the "tube." Finding these old radios has become a popular hobby. Collectors strive to locate the older sets made before the 1940s, but many of the later plastic models are also desirable. There were thousands of radio models made in the period from the 1920s to 1960, which is the period that most collectors look for. Never fear! There is help available to the novice collector in this rapidly growing hobby. In 1945, shortly after the end of WWII, the vacuum-tube models were being replaced with smaller, less power-consuming solid state transistor models with FM stereo and high fidelity. The manufacturing process moved overseas for lower labor costs, and by 1965, the end of the era was over. 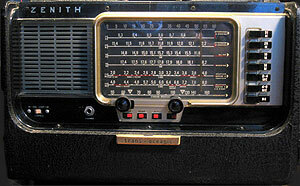 Collectible radios are usually the tube type, and therein lies a problem. Finding tubes and competent people to work on these old radios is difficult. Many collectors learn how to make their own repairs and not only save money, but discover another hobby as well. Some of the old vacuum tubes are so valuable that collectors will buy an old radio just so they can strip it for the tubes. 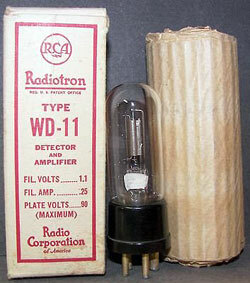 WD-11 tubes, for example, cost more than $100 each, and are hard to find. There are sources of vacuum tubes, parts, schematic drawings and items to fix up an old radio. Yard sales and flea markets frequently yield good finds. A good "company" source, Antique Electronic Supply in Tempe, Arizona is one of the largest (800-706-6789). One remarkable fact about the old units is that the vintage radios sound better than the best modern equipment. Apparently, it has to do with the type of speaker used before the early 1940s. The early models used a dynamic electro-magnetic speaker that was good for a full range of sound and frequency response, whereas the modern permanent magnet speakers require a woofer, midrange, and tweeter and still don't reach the same sound quality. There are a few more technical reasons, but a comparison is quite the experience. I recently had the pleasure of listening to the twelve-inch speakers on a 1940 Zenith console, while across the room, the same radio station was tuned to a modern radio, stereo, and CD unit with a 100 watt amplifier and a full set of quality speakers. The old Zenith had a noticeably better sound. Not a huge difference, but an improvement, nevertheless. Like any collectible, the condition of the radio is important. Points to consider: is the set electronically complete? If not, how much repair is necessary to make it work? Remember that old vacuum tubes may be cheap or very expensive. Is the cabinet in good condition? Are all of the knobs present? Is the case cracked, chipped or with any other noticeable damage? Is the veneer peeling or the case scratched? If the set has a cloth screen over the speaker(s), does it have any holes or tears? Does the price seem reasonable when checking with a price guide? Remember, when you are searching, the model numbers do not always follow a logical pattern, and can sometimes be confusing. There are many styles to choose from. The first is considered a classic. These are the Cathedral radios, which are taller than they are wide, with a round top and the speaker behind a grill. These are Table radios, and they came in many shapes and sizes. Midget is used to describe a table model that is smaller than seven inches on its longest side. Upright models are called Tombstone sets because of their resemblance to the graveyard fixture by the same name. The Breadboard style is an early radio with the tubes and other essential parts attached to a board that generally has "breadboard" ends. This type of radio has no cover or case and the internal parts are visible and unprotected. Floor models can also be called Console. It may have legs or it might just have a case that sits on the floor. The case is usually rectangular and taller than it is wide. Chairside is a console radio with a low profile so that it will sit behind an armchair. Frequently the controls are on the top for easy access. Highboy is a term used for floor models that have legs that can be as much as half the total height of the unit. Lowboy is a term used to describe a model with legs that are much shorter than half the set's height. Portable radios were made to operate on batteries, although many would operate on both battery power and home voltage. Clock radios also became very popular shortly after WWII. The early models are highly collectible. 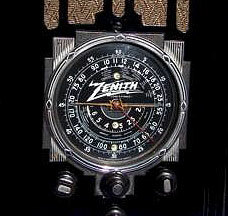 Some have almost a cult following, like the Zenith Transoceanic tube portable, which received both broadcast and shortwave. It was made in various models from the beginning of WWII until 1971, and sells for around $125 (Model B-600). Novelty radios cover a broad area of highly collectible items because of their rarity. Examples include Mickey Mouse, Pluto, baseballs, automobiles, etc. Plastics became popular during this period of radio development. Many of the brand names from the early days are still around, although now, many of their products are made in other countries. Zenith began in 1918 as Chicago Radio Labs. Their black dial sets of the 1930s are very sought after by collectors. RCA was started in 1919. They were pioneers in early broadcast radio, and started the National Broadcasting Co. (NBC) in 1926. Besides manufacturing complete radios, they also made Victrolas and other equipment. 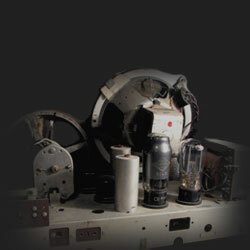 They were leaders in vacuum tube design and manufacture. They used a dog named "Nipper" in their company logo, which pictured the dog cocking his head to "listen" to his master's voice coming out of a funnel-shaped speaker. Motorola was a trade name of Azcvin Mfg. Corp. of Chicago, Illinois. Founded in 1928 to make radio power supplies, they soon were making auto radios, and later, they became a major manufacturer of television sets and radios. "Airline" was a popular brand sold by Montgomery Ward. They were made by Wells-Gardner & Co., Davidson Hayes Mfg. Co., U.S. Radio & Television Corp. and perhaps a few other companies. Only Sears "Silvertone" radios were sold in larger quantities by mail order. Not all of the brand names are as well known. Gilfillan Co. was formed as a smelting and refining company and started making and selling radio parts in 1922. 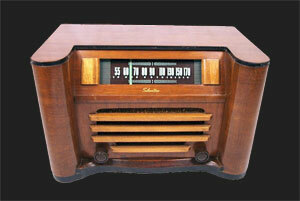 From 1924 to 1948, they produced complete radios and became the largest radio manufacturer on the west coast. That brief list does not include these other fine, old, and well-known brand names: Admiral, Crosley, Belmont, Emerson, GE, Hallicrafters, Magnavox, Philco, Philips, Raytheon, Stewart-Warner, and Trav-ler. Any radio with these names, and many more, would be a nice addition to an antique radio collection. Amateur radios, also called ham radios, are a special field of collecting that the average hobbyist shies away from. Another special area includes military radios as used by ground troops, aircraft, and ships, etc. They even had their own club - The Military Radio Collectors Group. Both of these special areas are not as popular as the home radios, but some people find them quite interesting and many collections of home-type radios will include a few. Whether you are new to the hobby, or an old-timer, a book of values can help avoid the mistake of buying an old radio you think is worth a great deal and then discovering it has little value. 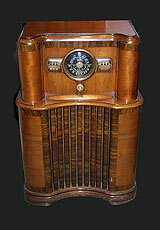 Don't forget that old radios, like most collectible items, usually increase in value from one year to the next. There are many available, but two popular books are the Complete Guide to Antique Radios: Tabletop,, by Mark V. Stein (Radiomania Pub., 2001). Another by the same author is The Complete Guide to Antique Radios: Pre-war Consoles, (Radiomania Pub., 2000). 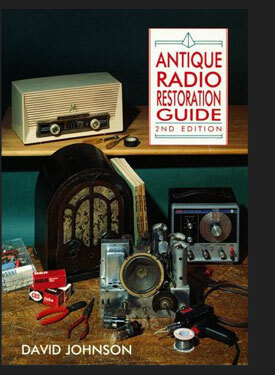 Another popular book is the Collector's Guide to Antique Radios by John Slusser and the staff of Radio Daze. Most collectors will eventually want to attempt some repairs, so the Antique Radio Restoration Guide by David Johnson (Wallace-Homestead Book Co., 1992) might help you prevent a headache or two. There may be a local club in your area. One of the best national organizations is the National Radio Club, Inc. You can reach them at P.O. Box 5711, Topeka, Kansas 66605. Some clubs even specialize in a specific brand name, but they are too numerous to list. You don't have to have extensive knowledge of radios to enjoy this hobby. A few cheap radios from your local flea market or yard sale will get you started, and some could turn out to be valuable.